The holidays are busy and usually have us running from function to function eating things that we typically don’t eat and in turn not always feeling the best. Supporting and maintaining our digestive health is crucial in keeping our immune systems in check and up to par. This can look different from each person but when we give ourselves 5 minutes to pray, meditate, dive into scripture, dedicate our day to God, or just 5 minutes to breathe in the morning it can start off in the right direction. One devotion that is amazing for the Advent season is Rooted in Hope, check it out! As we are running from a family gathering to holiday events and meeting up with old friends, a lot of our food options are not as healthy as we may typically eat. Having a back-up for a healthy snack or bringing a healthy dish to pass is another great option. Knowing that you have a healthy snack can help you to not overindulge on foods that you know will make you feel not so great later on. Drinking water is always important especially when it comes to our digestive health. Water can help us to not feel as hungry, when we add some lemon essential oil(grab yours here) it can help flush toxins and balance our bodies PH level, and it helps to properly hydrate our entire body so that everything moves smoothly- including our digestive tract. Another amazing and quick option to get some of those crucial prebiotic and probiotics into your life through the holidays is by drinking Kefir water or Kombucha. They taste amazing, you can buy them or make your own. Learn more here about each. Enzymes are key to life itself and therefore are a huge key to digestive function. They help us to break down food that is hard to digest and keep our intestinal tract moving along. Even though enzymes are found in the foods that we eat, due to the way we cook and process them very few are left to help us digest them. Essentialzymes-4 and Detoxzyme are amazing enzymes that can help you through the holiday season (grab yours here). The holidays can be rushed but take a moment and slow down. Enjoy the moments with your family and friends. Take the time and enjoy all of the little things- the laughter, the games, and the taste of your food. Don’t over-do things but instead slow down and enjoy them! We all know that sleep is a necessary daily activity but making sure to get enough sleep can make or break your holiday season. Turn off the phone a little sooner, give yourself 10 minutes to finish that project, and make sure to schedule those 7-8 hours of sleep that our body needs to function and be the best version of ourselves that we can be. What tips are you going to add to your life this holiday season? Start by adding one and gradually add all of them so that you can be the best YOU this holiday season. 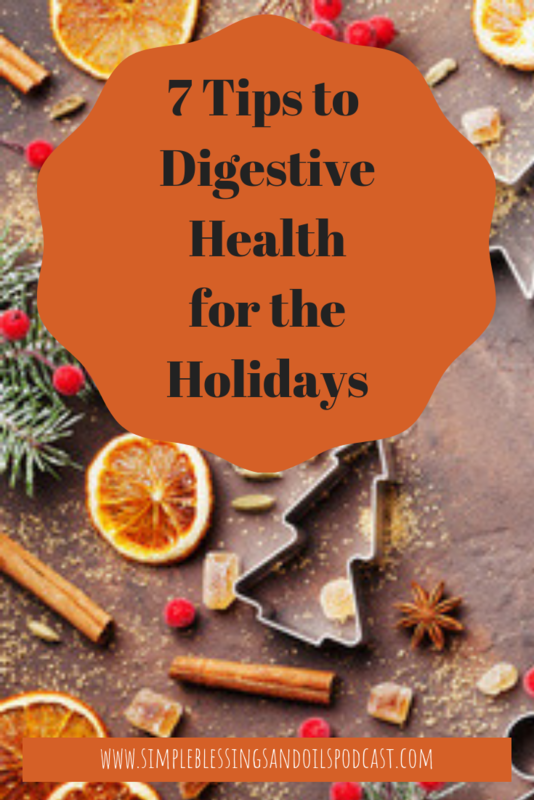 Here is to you and your digestive healthy this holiday season! Kefir water and Kombucha- what are they and what is the difference between them. Some of you may have heard of Kombucha and maybe you have even tried it but do you know why it is good for you and how easy it is to make? Kefir water is a little less know but similar. Kombucha and Kefir water are both fermented beverages. Kombucha is made with a scoby(symbiotic culture of bacteria and yeast), held together by polysaccharides. It looks like a mushroom but is not fungus. Kombucha is known to contain a variety of yeast and bacteria. Kefir water is made of “grains” which are a colony of bacteria and yeast. They look like small translucent grains. The term “grains” is only used to describe their appearance. Kefir grains contain no actual grains such as wheat, rye. Etc. They also contain a variety of bacteria and yeast. Kombucha is prepared by adding starter tea and a kombucha culture (your scoby) to sweet tea (black, green, oolong, etc). This Is then fermented for 5 to 30 days depending on the flavor you desire. 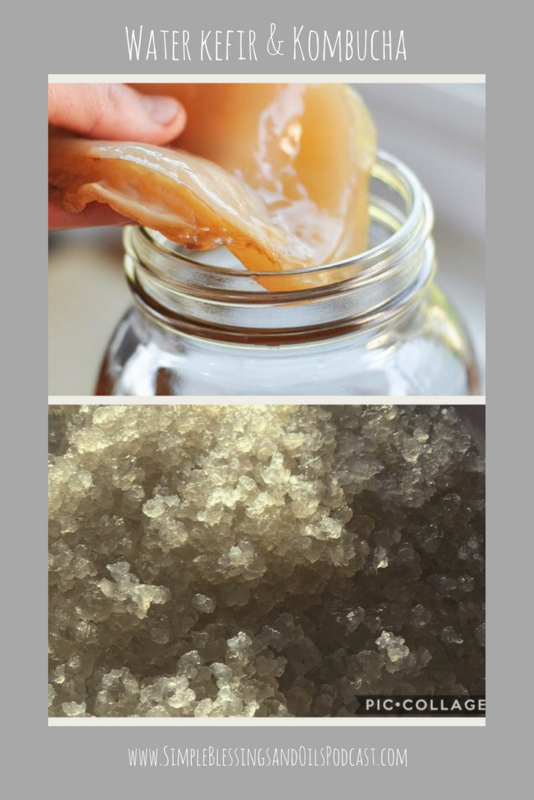 Water kefir is prepared by adding water kefir grains to sugar water (we add a little molasses and baking soda for added minerals). This is then fermented for 24-48 hours. Kombucha is tangy, kind of sweet and effervescent. The flavor varies greatly depending on how long you allow it to ferment and the tea that you use. The fermenting or culture time really determines whether the kombucha tea has a very mild taste or a strong vinegar-like taste. Kombucha can be flavored or you can drink it plain as well. Water kefir can be sweet and the longer we let it ferment or culture the less sugary it is. It is recommended that you flavor water kefir because the taste of plain water kefir isn’t as pleasing. Kombucha can aid in our digestion It also adds to our beneficial bacteria in our gut and it contains some acids and enzymes to aid in breaking down food. Water kefir is more so a probiotic drink. It contains acids and enzymes to aid in digestion though not quite as strong as those in kombucha. Water kefir does, however, have a greater number of bacteria strains than kombucha. Both drinks are very beneficial in aiding our natural body systems and both are great for hydration. Depending on what flavor you like and the health benefits you are looking for, consuming one or both is a matter of individual preference. Culture growth The mother scoby always produces a baby which can be given away. Grains will multiply- sometimes slower and other times very quickly. Health Benefits Detoxifier & digestive support. General health & probiotic supplement. The finished water kefir is now ready to consume, or flavor. To make larger batches, use up to 2 cups grains and use 1 cup cane sugar per gallon of water. The best method for removing water kefir grains from finished water kefir is to use a plastic mesh strainer. Simply set the strainer on top of a clean jar and pour the entire batch of finished water kefir through the strainer into the jar, catching the grains. Transfer the grains immediately to the new batch of sugar water. Combine hot water and sugar in a glass jar. Stir until the sugar dissolves. The water should be hot enough to steep the tea but does not have to be boiling. Place the tea or tea bags in the sugar water to steep. Remove the tea bags or completely strain the loose tea leaves from the liquid. Add starter tea from a previous batch to the liquid. If you do not have starter tea, distilled white vinegar may be substituted. Add an active kombucha SCOBY. Cover the jar with a tight-weave towel or coffee filter and secure with a rubber band. Allow the mixture to sit undisturbed at 68-85°F, out of direct sunlight, for 7-30 days, or to taste. The longer the kombucha ferments, the less sweet and more vinegary it will taste. Pour kombucha off the top of the jar for consuming. Retain the SCOBY and enough liquid from the bottom of the jar to use as starter tea for the next batch. The finished kombucha can be flavored and bottled, if desired, or enjoyed plain. Ask on your local crunchy mom’s Facebook group or check out www.culturedhealthforlife.com to purchase kefir or kombucha supplies. Have you tried either? Which drink are you ready to try? What is your favorite flavor?